Hill 60 (Kaiajik Aghyl, or Sheepfold of the Little Rock), on the 60 metre contour line, is the end of a range which runs south-eastward to Hill 100 between Kaiajik Dere and Asma Dere. Hill 60 (New Zealand) Memorial is situated in Hill 60 Cemetery, which lies among the old trenches. It is reached along an 800 metre track, which requires a 4-wheel drive vehicle during wet weather. The Memorial is situated within the Hill 60 Cemetery. The site is permanently open and may be visited at any time. 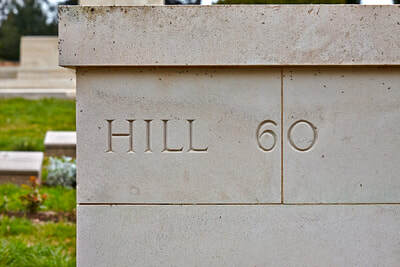 At the beginning of August 1915, Hill 60, which commanded the shore ward communications between the forces at Anzac and Suvla, was in Turkish hands. On 22 August, it was attacked from Anzac by the Canterbury and Otago Mounted Rifles, followed later by the 18th Australian Infantry Battalion and supported on the flanks by other troops. It was partly captured and on 27-29 August, and the captured ground was extended by the 13th, 14th, 15th, 17th and 18th Australian Infantry Battalions, the New Zealand Mounted Rifles, the 5th Connaught Rangers, and the 9th and 10th Australian Light Horse. The ground was held until the evacuation in December. 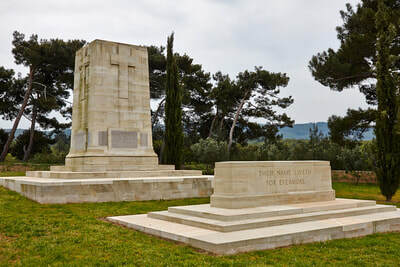 The HILL 60 (NEW ZEALAND) MEMORIAL is one of four memorials erected to commemorate New Zealand soldiers who died on the Gallipoli peninsula and and whose graves are not known. This memorial relates to the actions at Hill 60. It bears more than 180 names. HILL 60 CEMETERY lies among the trenches of the actions of Hill 60. It was made after those engagements, and enlarged after the Armistice by the concentration of graves from Norfolk Trench Cemetery and from the battlefield. There are 788 burials and commemorations in the cemetery. 712 of the burials are unidentified, but special memorials commemorate 34 casualties known or believed to be buried among them.